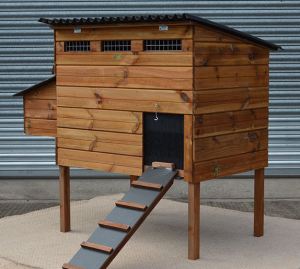 the Omlet plastic chicken coops, poultry accessories and feed - plus hen/chicken boarding service. We are based in Leatherhead, Surrey. Visits by appointment only. Made for the smaller budget in mind. Now comes with run end door. The Stafford comes in two sizes – the ‘Junior’ will hold 4-6 birds and the ‘Standard’ 8-10 birds, both have externally accessed nest box(es) and slide out poop tray/floor for ease of cleaning both as standard. They come with 2 removable perches and ramp to pop hole. The roof is hinged to allow access/cleaning of coop. The coop stands 15” from the floor. The coop can come as a raised stand alone house, or house and run combined. up to 6-8 standard sized birds. A run and extensions can be purchased separately. 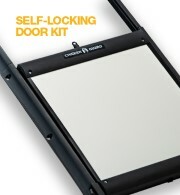 Price includes slide out droppings tray, two nest boxes, etc. Additional 1 metre extensions also available. Comes in three lengths 12m, 21m and 32m. It is very easy to erect and move around. It can be used to keep your chickens ‘within’ an area, or ‘out’ of an area, like your prized vegetable patch, or best flowers! All the poles have two spikes making it easy to 'tread' them into the ground plus it also comes with a gate, making it easy to get in and out of. The bottom section of the netting’s holes are only 50mm wide, higher up are 100mm wide. Overall netting height 1250mm, which is taller than most netting. Please note: This netting cannot be electrified. Provides a good deterrent against predators, keeping your chickens safe. Easily moveable, can be powered by either mains electricity (220v) or from a 12v battery. Height 110cm. The kit includes energizer, 25m or 50m netting, gate, posts, guy ropes, pegs, repair kit, 4 rigid double spoke corner posts, earth stake and warning sign. The only additional item you will need to purchase is either a lead out cable (for mains connection), or a 12v battery. Size approx 180cm x 87cm x 53cm high, or (6ft x 2’10” x 1’9” high). 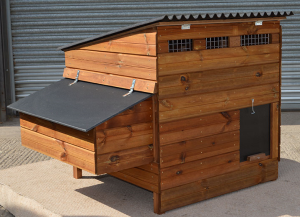 Run now comes with run end door – to let your chicken/rabbits out in garden. Size approx (6ft x 3ft"x 2’2" high). All housing/runs in stock and available for you to take away TODAY! As an addition to all poultry housing, how about considering purchasing either an electrified, or non-electrified netting kit? Thus giving your chickens an additional area to roam (see our Accessories page for further details). For further enquiries, please telephone (01372) 458320, or 07963 013597. For viewings, collections and enquiries we are open Friday, Saturday, Sunday, Monday and Tuesday (10.00am to 4.30pm) ALL YEAR ROUND. PLEASE NOTE – viewing and collection is by Appointment only. So why not call today!